ALL COLORS AT THIS PRICE! Here is a fantastic deal on a great sub ohm tank. The website will say $4.99 but that is for the stainless steel which is out of stock. The price I'm showing is for all the different colors which at the time of this post are all in stock. Just a great price! Below wholesale. 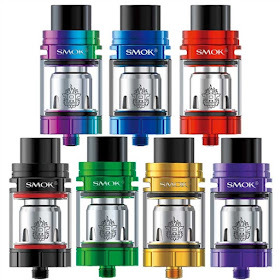 The SMOK TFV8 X-Baby Sub Ohm Tank brings the incredible performance of the TFV8 tank family into a compact structure with upgraded features that places it a step above its predecessors. Packed with updated features such as a leak-proof top airflow system, newly designed coil structures and an impressive 4ml e-liquid capacity makes the TFV8 X-Baby a true contender in the highly competitive sub ohm tank market. 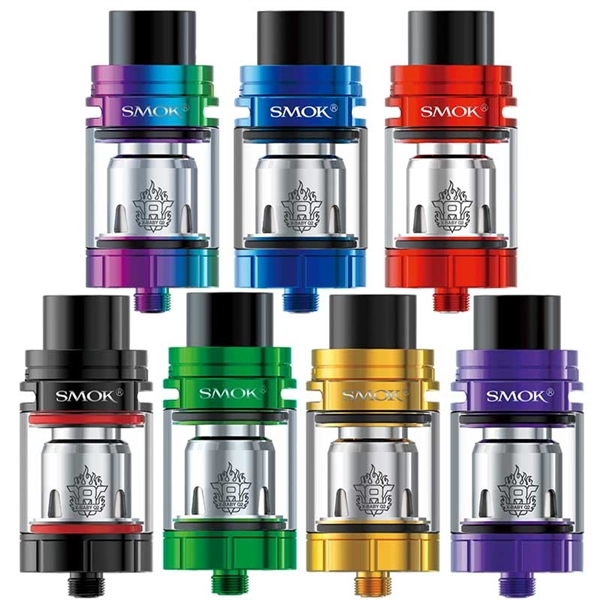 The SMOK TFV8 X-Baby Sub Ohm Tank is machined from high-grade stainless steel components with a larger base diameter to 24.5mm to give it a 33% increase in its e-juice capacity inside its 4ml Pyrex glass tank. Unlike its older brothers, the SMOK TFV8 X-Baby has been updated with a new top-airflow control structure with two large adjustable air slots that redirect air straight into the atomizer chamber for a leak-proof and flavor-centric vaping performance. The top airflow design of the TFV8 X-Baby Sub Ohm Tank brings air quickly and efficiently into the coil base for rapid vaporizing and cloud delivery. Included with the TFV8 X-Baby Sub Ohm Tank are two new coil designs, the preinstalled X-Baby V8-Q2 coil head that is rated at 0.4 ohms with a wattage range of 30 to 50 watts for robust flavor creation. The second is the V8-M2 coil head that is rated at 0.25 ohms for a smooth and warm vaping experience. A welcomed addition to the SMOK sub ohm tank family, the TFV8 X-Baby Sub Ohm Tank is a brilliantly designed tank that is packed with features that offer a flavor-centric vaping experience. Backed by its own set of high performance coils, leak-proof top airflow ports, upgraded qualities and sleek finish—the SMOK TFV8 X-Baby Sub Ohm Tank makes for the ideal choice for any vaper looking for a more compact and highly capable sub ohm tank.